In the last decade Tommy Clufetos has bagged an enviable list of rock gigs - Alice Cooper to Rob Zombie, Ted Nugent to Ozzy Osbourne. But they all pale in comparison to his latest gig as he takes up residency behind the kit for Black Sabbath. Rhythm gets the lowdown from Tommy on replacing the irreplaceable Bill Ward, pounding arenas night after night and why he didn't play on Sabbath's new record. Plus: We take a tour of Tommy's kit and find out why two bass drums are better than one! Rock Roundtable: Scott Phillips (Alter Bridge), Barry Kerch (Shinedown) and Arejay Hale (Halestorm) tell you how to make it as a rock drummer! Find out how to nail Pantera classic 'I'm Broken', 'Kick Out The Jams' by MC5 and The 1975's hit 'Girls'. Plus there's all of your favourite regular lessons from Pete Riley, Jason Bowld, Adam Bushell, Erik Stams and Colin Woolway. 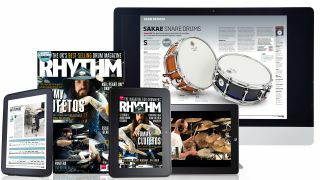 All this and more in the February issue of Rhythm available now from all good newsagents, online or digitally at the Google Play Store or Apple Newsstand from 14 February. Get yourself a copy from Apple Newsstand and enjoy all of our tuition content plus bonus videos, image galleries and other content.